Since we installed the Watt&Sea POD 600 in Las Palmas, we've sailed more than 2'500 nm with it. Some people have been asking for feedback on it, so here it is! We have been using Linux on board since our second season on Soledad - three years ago. There exists quite a large collection of marine/sailing software for Linux. As you might know from previous posts, we mainly use OpenCPN and zyGrib for navigation. In this post, I will explain how we got more by connecting our computer to the boat's electronics and to an Iridium satellite phone. We literally spent the winter in Las Palmas de Gran Canaria. El muelle deportivo de Las Palmas is a huge marina in the centre of the city. At walking distance or by bus (bus pass available at the marina's mini-market) you can find whatever you need. We enjoyed the spannish/canarian culture (carnivals, holy week, etc.) and the weather has been good (even though locals say it's been one bad winter). Are we ready for an Atlantic crossing? 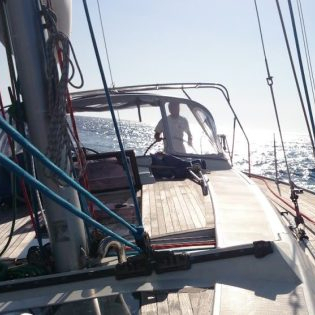 Last months, we had two funny passages: one from Rabat to Graciosa Island and other from Lanzarote to Las Palmas. During the last weeks we have been wondering about crossing the Atlantic. After thinking and discussing about it, we agreed that we are not ready yet - at least not in a way that would make us confident about it. The other conclusion is that we want to be ready to cross the Atlantic ocean by the end of 2018. Complexity is not your friend at sea. When sailing, you need systems that just work... or that can fail gracefully, at least. In order to deal with this growing complexity, we decided to cut it into manageable chunks with some "Agile-Fu". During our first 4 summers on board, we (had to) improved several times the electrical systems on board Soledad, our Hanse 430e. By improving, I mean we managed to get a better autonomy AND more comfort at the same time. "Better autonomy" was the goal. From 2014 to 2016, we spent as much time sailing as we could. Iteration by iteration, we improved sailing and anchoring safety and we finally got autonomous with fresh water.